Having suffered from asthma for the majority of his childhood and into his teens, Dr. Jody discovered chiropractic care after a friend suggested he give it a try. After speaking with a chiropractor about how the nervous system needs to be functioning well in order for the rest of the body to work optimally, his interest was piqued. Dr. Jody received his first adjustment and noticed he was breathing better and sleeping better, so he continued visiting the chiropractor until his symptoms improved—so much so that he was able to exercise and play rugby in college. This was something he’d never been able to do before without risking an asthma attack. Because chiropractic had played such a pivotal role in his own life, Dr. Jody knew that this was the career path for him. He chose to attend the renowned Palmer College of Chiropractic where he received his Doctor of Chiropractic. After graduating in 1982, Dr. Jody began helping patients feel better naturally with a hands on approach to care. Dr. Jody holds professional memberships with the New Jersey Association of Chiropractors, the American Chiropractic Association and the New Jersey Chiropractic Society. He is also a Diplomat of the National Board of Chiropractic Examiners. 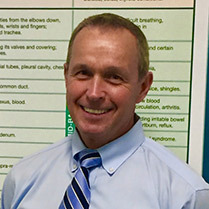 Dr. Jody has had the pleasure of treating athletes of all levels and entire families, including some who began care with him as a child who now bring in their own children for routine care. Ready to find out how chiropractic can change your life? Schedule your first appointment at The Center for Natural Health & Rehabilitation today. We look forward to helping you and your family feel and heal better! Contact our practice to schedule your visit with Dr. Jody.